Mint is creating blog posts and diverse stories. Hello! I'm Mint, and I am an illustrator, blogger, and creative writer! I've created this Patreon for anyone who wants to support me while I do my work, and get involved in the process! 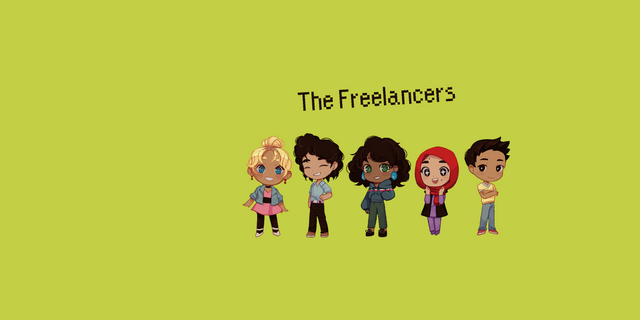 I am currently working on a novel called The Freelancers, about a group of five teenagers who mysteriously gain psychic powers, and have to protect their town from forces that are also mysterious! (and possibly evil!). The key is that they're all minorities that live in a suburban hellscape. I use the word "forced" because, well, maybe they're not so keen to save this town in the first place, when it's always been so toxic and antagonistic towards them. Its premise stems a lot from my own apathy towards the primarily white suburbia I lived in when I myself was in high school. Beyond that, however, I wanted to write it because I wanted to tell the stories that I myself enjoyed reading as a kid — with their mysteries and magic and action and adventure — but with faces that looked like mine. I love creating diverse stories with engaging characters and punchy dialogue (for real, I love writing dialogue). When it's completed, The Freelancers will be available for free on itch.io. Lenis Aura / Gentle Breeze is a blog that I maintain! It has all sorts of stuff on it, including writing tips, fanfiction about My Hero Academia and a review about Red Dead Redemption 2. It's now taking shape into something I use as a place to talk about things I'm watching, playing, reading, listening to, and writing about, as well as a look into my creative process. Support of this Patreon helps with my motivation, and gets you access to a bunch of fun stuff! You get: my eternal gratitude! Which is worth at least a dollar, in my opinion! Oh, and chapters of The Freelancers I guess. Chapter drafts of The Freelancers! Blog posts a week before I put them on Lenis Aura! My undying loyalty! Which is at least worth $5! A vote on blog posts! A vote on The Freelancers content! My blade for your cause! Which is worth at least $10! I will write a short story of your choice! Want a thrilling tale about your OC? Want me to add to your already giant pile of Garrus x Reader fanfic? This is the tier for you! Stories will be 1,000 - 2,000 words dependent on complexity. I will defend your favorite Zelda game for you on Twitter for a full 24 hours! Which is worth at least $15! I can finally buy Scrivener, putting me one step closer to being an extremely obnoxious writer online.